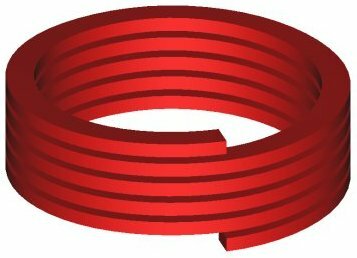 Normally our electromagnetic simulation software MAGNETO (2D/RS) would be sufficient, though chokes with air gaps might require AMPERES. High voltage chokes may require analysis of the electric fields in and around the device to determine safe operating conditions. Usually this requires COULOMB, though simple geometries may permit the use of ELECTRO (2D/RS). If the core and plug in adjustable core inductors possess rotational symmetry, an RS MAGNETO model should be sufficient, but complex geometries or examination of fields external to the inductor might require AMPERES. The presence of both DC and AC windings in saturable reactors necessitates a transient analysis using OERSTED . High voltage inductors may require analysis of the electric fields in and around the device to determine safe operating conditions. Usually this requires COULOMB, though simple geometries may permit the use of ELECTRO (2D/RS). In the case of current limiting reactors, if the reactor possesses rotational symmetry, an RS MAGNETO model should be sufficient. Complex geometries or examination of fields external to the reactor might require AMPERES. High voltage reactors may require analysis of the electric fields in and around the device to determine safe operating conditions. Usually this requires COULOMB, though simple geometries may permit the use of ELECTRO (2D/RS). 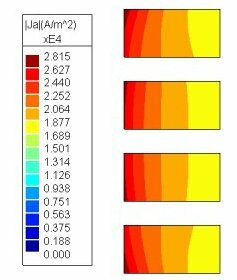 Simulations using Integrated CAE software permit determination of inductor performance and equivalent circuit parameters.